Indian painter Sayed Haider “S H” Raza (1922-2016), who lived and worked in France for 60 years from 1950 to 2010, is internationally known, but not in Mandla in Madhya Pradesh, where he was born and brought up. Son of a forest ranger, he lived in a cluster of nine hutments and studied in a government school in Kakeya. After spending his childhood for nearly 10 years in the district, he went for higher studies at the Sir Jamsetjee Jeejebhoy School of Art in Bombay and then at Ecole Nationale Superieure des Beaux- Arts in Paris where he met his wife Janine Mongillat. After her death in 2002, he moved to New Delhi. One of his paintings was auctioned for Rs 210,000,000 ($1=Rs 67). A recipient of several awards including India’s Padma Vibhushan, Kalidas Samman and the highest French decoration The Order of Légion d’Honneur, he had no children. He died in Delhi on 23 July 2016 at the age 93 and was buried near his father’s tomb in Mandla. In order to make the people of Mandla aware that there once lived a great legend amongst them, the Raza Foundation organises several functions on his death anniversary. The second such function, Raza Smriti (Memory), was held for five days in Mandla from July 20 to 24, 2018 in which about 5,000 students of tribal school, girl school and government schools were trained in painting and terracotta (clay) art. After school hours, students as well as the public also participated in workshops during which 200 umbrellas were distributed which after painting they took home. 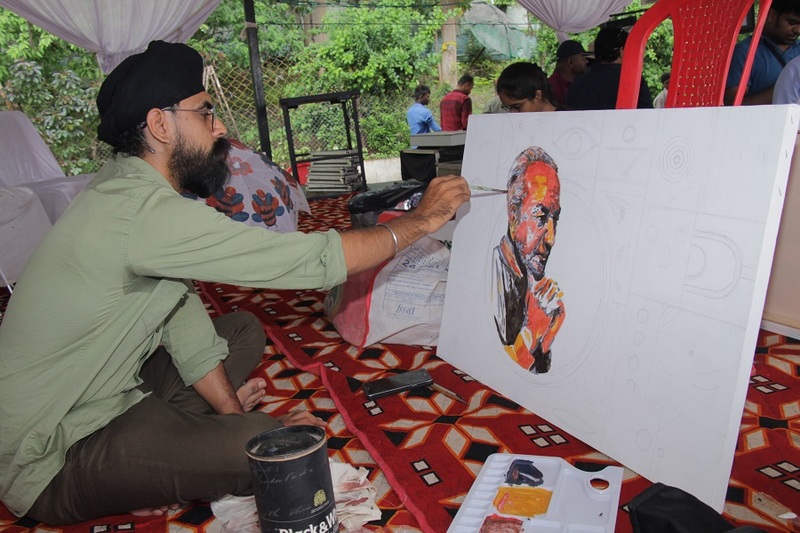 Twenty artists from the nearby Fine Arts School and five from the Raza Foundation, apart from others guided the participants. Musical programmes by local artists were also held in the evenings. According to shilpkar (artist) Bigam Prajapati of Maharajpur, many students participated in both school and post-school workshops. Class 11 student Arin Mishra said he came to the workshop after learning the basics of painting in the school workshop. Arvind Pathak, who taught Gond Art, said he enjoyed teaching the students and they were fast learners. Twenty-one -year-old Surabhi Vakhel thanked Raza Foundation for conducting such workshops. 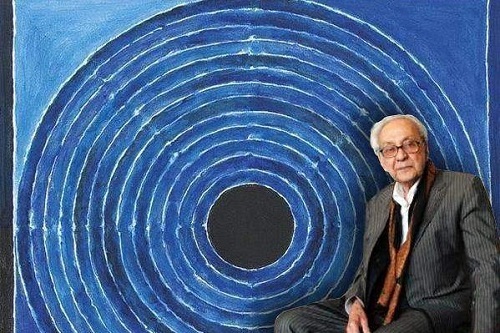 Ashok Vajpeyi, former bureaucrat, poet, and managing trustee of the Foundation, who knew Raza since 1977, said, the painter was very much attached to Mandla. During partition in 1947, even though his first wife and three brothers left for Pakistan he continued to stay here. The main reason was that Raza did not want to do injustice to the ‘old man’ (Gandhi) he had met at the age of eight in Mandla during his India tour. This meeting had a great impact on young Raza. According to Vajpeyi, he had accompanied his father’s guard, who went to meet Gandhi in civil dress. Though his brothers Imam, Ali and Yusuf were well placed in Pakistan, Raza never visited them. The other reason for Raza to stay back in Mandla was that his father was buried here. Moreover, the iconic bindi (dot) that changed his life for the good happened in Mandla. (As he was a wavered child, his primary school teacher Nanda Jharia, drew a dot on the school veranda and asked him to concentrate.) As a result, Raza started drawing paintings with a bindi at the centre. Raza loved his mother tongue Hindi which is evident from the fact that most of his canvases from 1980 were titled in this language. Many of his works also had verses from Upanishad and poets Kabir, Tulsi Das, Agyeya, Meher, Mahender Verma, etc. He had great respect for Gandhi and had painted seven on him, of which two had Gandhi’s favourite words ‘He Ram’ and ‘Shanti, Sabko do Bhagawan’. A multi-faith man, he would visit temples, mosques and churches every week without fail. He spoke three languages – Hindi, French and English. “He was modest, handsome and tall. Above all, he was generous – the most generous artist India has seen during the last 10 years,” added Vajpeyi. The Raza Foundation promotes arts, poetry, etc, among youth. It also conducts conversations and panel discussions on arts. Its monthly activity, Art Matters, has conducted 56 sessions so far in Patna, Bhopal, Calcutta and Delhi. The Foundation has also organized eight annual memorial lectures on well known Hindi writers like Mani Kaul, Agyeye, etc. 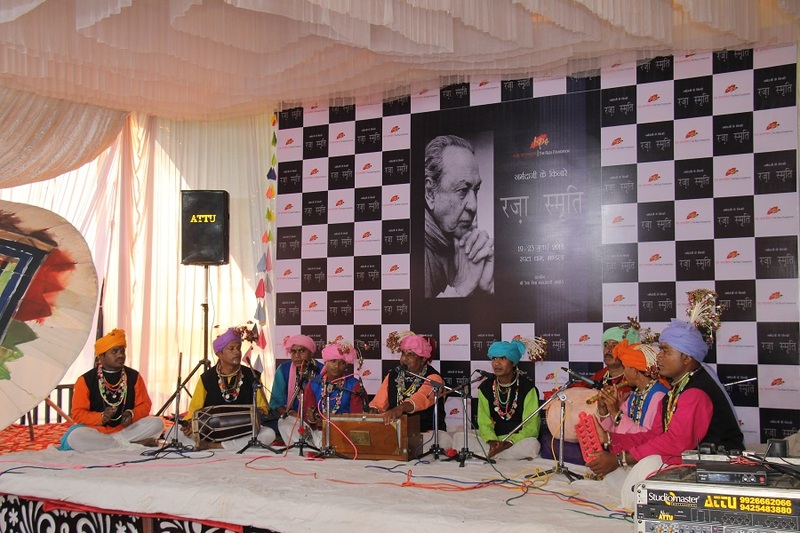 It has also conducted nine sessions for young artists, which will soon be extended to schools also. It also publishes three journals – one in English and two in Hindi. Raza Museum adores his last painting, Uttar Rag, Since 2009, Raza has done 40-45 works. Through the Roop Aroop programme, the Foundation wants to select young artists as curators. Vajpeyi said ‘Raza Memory’ will be held every year so that a certain crescendo could be created during his birth centenary 2021-22. The Foundation also dreams of constructing a permanent structure of Raza in Mandla, installing his life size statue at a prominent place on the bank of Narmada, and a road named after him. He loved Mandla and the Narmada river which was evident from the fact that whenever he entered the district, he would smear his forehead with mud of the land and water from the river. Superb research done by Mr José and hús articles are telling the truth and young journalist take advantage of hús articles. Mr José is a great admirer of art and culture.